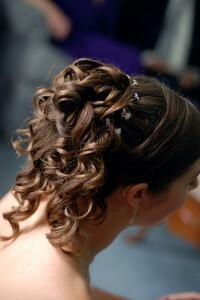 Curly Updo hairstyles are immensely popular at prom night, wedding ceremony as well as other formal occasions. Not just that, celebs are also heating up red carpets with curly updo hairstyles – from Taylor Swift to Salma Hayek to Julia Roberts, there are countless inspiration if you are planning to sport a curly updo style for a formal event. Curly Updo hairstyles have a whole lot of different variations. In fact, there is something for everyone. Select a hairdo that would suit your appearance and also turn some heads. If you still want to ‘shine’ things a bit, do not be afraid to employ blonde or red shades.